A big congratulations to coach Ryan Roberts and the girls in Under 15,17 & Opens last Friday night. A mixture of new and old players started the season off with a bang. It was a pleasure to see the Ladygator’s organised and ready to play more than any other Gold Coast club. They won the majority of their matches showing plenty of skill in attack and aggressive defence. 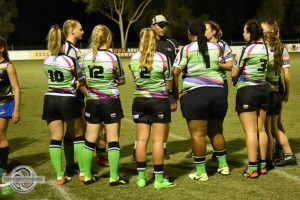 After a long build up leading into the GCDRU Girls Rugby 7’s competition, our competition kicked off at the Surfers Paradise Rugby Club on Friday night. We fielded teams in the U15/17’s and Opens and after a few recalculations on the draw produced, we were excited to have our Gator Girls out on the field in the new Jerseys. The Girls all played very well and at times looked like they had been playing for the last couple of weeks, rather than the 1st games of the season. While we had to borrow a few players in the U15’s to take the field, we are hopeful for more Girls coming along and giving Rugby 7’s a try from our local schools after commencing school engagement programs for Term 2. Our Open Women’s team were outstanding in defence, proving this year will be an exciting one out on the field. Keep an eye out for venue and dates on Facebook, as this group of Rugby players would love as much support as they can get at the games.